The Canada Lynx is a brownish-gray cat, larger than a Bobcat and distinguished from that species by its long black ear tufts and longer legs. Throughout its range its main prey is the Snowshoe Hare and Canada Lynx populations are largely dependent on healthy hare populations. Canada Lynx once ranged throughout much of the Northeast and Northwest forests. However its numbers have now dwindled to only several hundred scattered individuals, with the last remaining populations in Maine, Montana, Idaho, and Washington. Maine has the only Canada Lynx population in the entire eastern United States. For almost a decade, conservation groups from around the country used legal means to pressure the US Fish and Wildlife Service to protect the Canada Lynx under the Endangered Species Act. 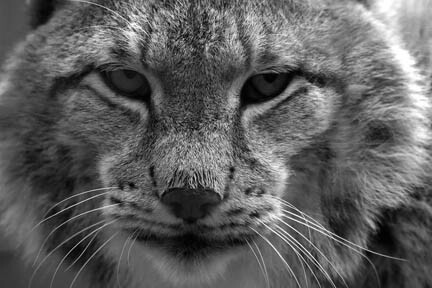 This hard work eventually paid off and in March 2000 the Canada Lynx was protected under the Endangered Species Act, listed as a threatened species. Despite the ESA listing, however, on-the-ground efforts to recover this species are proceeding at a slow pace. Under a court order, the U.S. Fish and Wildlife Service has finally proposed designation of critical habitat for Canada Lynx. The USFWS habitat proposal includes lands in the Moosehead region that are essential to the survival of lynx in this part of our country. However, the Plum Creek corporation is seeking exemption from the critical habitat designation for its lands in Maine even before a decision has been made by the USFWS about whether the designation will be applied. During spring 2006, Plum Creek has reportedly been in Washington, D.C., lobbying senior officials in the U.S. Department of the Interior. There is no reason Plum Creek should be exempted from the Endangered Species Act. It is disappointing that they are trying to use their lobbying reach to get special treatment. With suitable habitat and abundant prey, Maine represents the best opportunity in the northeast for the survival and eventual recovery of the Canada Lynx. However, more active recovery steps must be implemented to ensure that the Canada Lynx and its wild habitat is restored, and a good place to begin would be to deny Plum Creek an exemption from the Endangered Species Act. Contact the USFWS and tell them that the critical habitat designation for Canada Lynx habitat should apply to Plum Creels lands in Maine.